Moving! We have all had to do this at least one point in our lives and many of you may have moved more times than you would have liked! The idea of moving and starting fresh can be a fun feeling and the opportunity to get rid of 'stuff' excites me as I pack and thin out. Where the dread comes in is about box number 20! Then you have plans on where everything will go in the new space only to realize you still have 'other items' that need a spot and where is my junk closest going to end up in the new place? We always find that closet! Whether you enjoy moving or despise it, one thing remains true for every mover-safety has to be a priority! Moving to a new place brings a bit of insecurity. Unfamiliar sounds and location makes us a bit vulnerable and feeling out of place. If you are moving with kids, this is especially true for them. Master Lock wants to take this National Moving Month to bring you some tips and they also are allowing me to giveaway a piece of security-the Master Lock BCCO0615 Entry Door Lock with Single Cylinder Deadbolt. · Secure All Valuables: Whether you’re moving your own belongings or have hired movers, it is important to pack all valuables in enclosed, secured containers. For fragile or breakable items, use an added layer of protection, such as bubble wrap or shredded newspaper. In the midst of moving mayhem, remember to lock your trailer with a Master Lock 379DAT Universal Trailer Coupler Lock that resists picking and prying when not in use or in between trips to avoid possible theft. · Inventory Personal Belongings: Label your boxes by room, number or color-code, and create a list of the items in each box. This will keep your personal possessions organized for when you begin the unpacking process. When you arrive at your new home, make sure to check each list to ensure all your belongings made it safely and securely. Investing in a Sentry Safe SFW123TTC Extra Large Digital Alarm Fire Safe will assure your most important valuables remain safeguarded and protected as you settle into your home. While you may have heavy foot traffic between movers, cable providers and other vendors setting up your new space, this Sentry Safe Extra Large Digital Alarm Fire Safe’s loud alarm will quickly alert you if there is suspected tampering. · Install New Exterior Locks: Less than half (47 percent) of U.S. and Canadian residents changed or rekeyed the locks on their new home. ** As a major safety precaution, you should change all the exterior locks on your new home either before or when you move in. Previous tenants, realtors and other unsuspected people may have keys to the current locks. Replacing these old locks with new ones, such as the Master Lock BCCO0615 Entry Door Lock with Single Cylinder Deadbolt, will provide additional security with peace of mind, and ensure you are the only person who has access to your home. · Change of Address: Before officially moving into your new home, make sure to visit your local post office or visit usps.com to fill out a change-of-address form. To avoid unintentionally giving strangers access to personal information, such as billing statements, credit card offers and insurance information, change your address before your move. · Explore Your Neighborhood: Once you’ve settled in, make sure to familiarize yourself with your new neighborhood. Take a bike ride to meet your neighbors, locate the police and fire stations and find your local park district. Don’t forget to lock up with the Master Lock 8127TRI Keyed Cable Lock while exploring your new surroundings. For more moving safety tips and products, visit the Master Lock website or connect with Master Lock on social via Facebook, Twitter, Pinterest or YouTube. 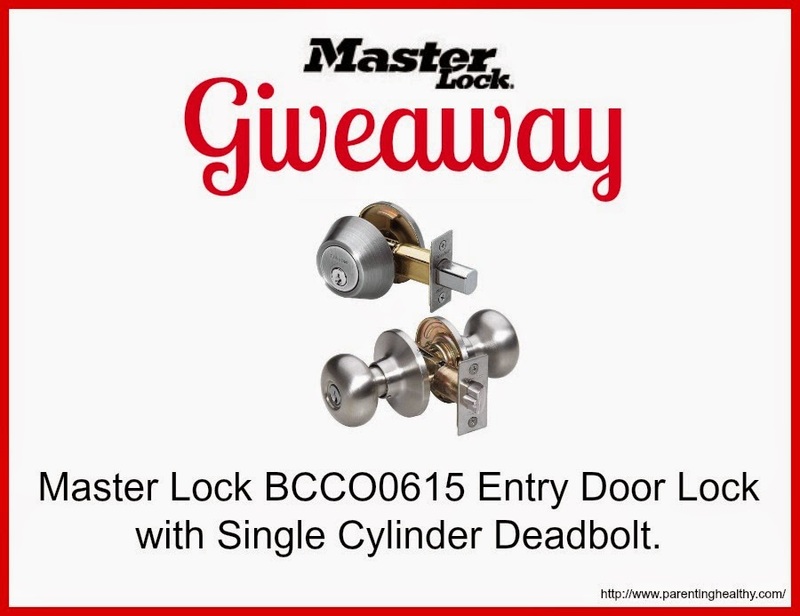 1 lucky reader will win the Master Lock BCO0615 Entry Door Lock with Single Cylinder Deadbolt. Enter below. Open to US and ends on 5/18. Good luck. The 2-3/4 in Wide Set Your Own Combination Portable Key Safe would be great and better than putting a key under a rock. I'd like to get the No. 8195DLW bike lock for my husband's bike. I like their Portable Personal Safe! I'd love to have almost any of their door locks. Our back door lock is broken - it's locked, but can only be unlocked from inside, not with the key. Can't afford to replace it right now! I think the Vertical Set Your Own WORD Combination Padlock is pretty neat!